(02-24-2017 07:07 AM)The T-Shirt Wrote: Saw it not too terribly long ago. Definitely different. Not horrible. Will be interesting to see how they implement the replacement seating. Luckily, thanks to the added income (per Bohn) we are getting the fancy video board, sound system, and ribbon boards for this upcoming season. Something Nippert has been clamoring for for ages. All of which will be utilized to push even more advertising at fans. These will not enhance the game day stadium experience. The end zone isn't terrible as long as Mike Bohn does something in the cutouts. Leaving them empty during football games is the worse possible thing you can do. Call me crazy, but couldn't they add some temporary bleachers or seating for football games and have that be the designated place for the band? They would have to keep the band together, but it isn't a bad idea. You'd have half of the band before the wall, and half above. Still leaves the other side open though. They can do it for safety reasons. No more running down. Or would they just return to the cutouts after the game opening performance? I see no opening in the corner kick cutouts that allow entrance up into the stadium. Thus how could people sit therein without access to toilets etc. Looks to me that there is no intention to have seats therein. Looked to me like you'd have to get down on the field to get into the cut out areas if portable stands were placed there. It's walled in on three sides. (02-24-2017 09:38 AM)CliftonAve Wrote: IF FCC gets into the MLS, the contract states the numbers will be re-figured. Atlanta United is paying Georgia Tech $45,000 rent per game, a $275,000 fee for the locker rooms, $350,000 to alter the field, giving GT $2 from all ticket sales and splitting concessions. Interesting, how do these numbers compare to UC's deal with FCC? I believe the contract info that was posted here some time ago stated UC receives $0.25/ticket over 80k tickets, $5k/game, $20k/season for locker rooms/other facilities. Concessions sales are split after FCC has paid for the renovations from the concessions money. I'm sure if UC pulled the money for this out of its donors' pockets the advertising would be minimal. I, for one, would like to be able to hear the band or other music played more clearly, or would at least like to be able to hear what the announcer is saying. The ribbon boards and new video board will make Nippert look much more modern and first-class. It just seems like you're grasping at straws now. What would be the point in comparing those numbers? Georgia Tech is in the ACC and Atlanta United is in the MLS. They both essentially operate in the upper tier of their respective sports. UC is in a mid-major conference and FCC is in the USL. The stake is larger for GT and AU so their deal would be greater. They don't. My guess is the owner of the Atlanta team is not one of Georgia Tech's largest donors. But I could be wrong. Like it has been on the current ribbon boards? Like it is at Shoemaker? Stats may get put up for 10-15 seconds once a game. And of course they are "delivered to you by UPS". And nothing looks "first class" about those cutouts in the south endzone. I have to laugh at what a fit so many of you are throwing about this. Any outside observer would not fathom the problem. Count me in the crowd of I like FCC, I would love a new sound system (long overdue), and a new scoreboard. And I don't see how the new design takes away one iota from the football experience. If anything it gets rid of SOME seats that nobody could see from anyway. I don't think FCC will get into the mls any time soon. And if they do, they won't play at Nippert, which would be a HUGE mistake as Nippert is a big part of the draw. In the meantime, the 15k coming to FCC games only helps expose more to UC and UC football. And adds some coin to pay for some enhancements. So you don't want advertising/sponsorship money. Nor do you want the money from FCC because the wall won't be perfectly round like it used to be. 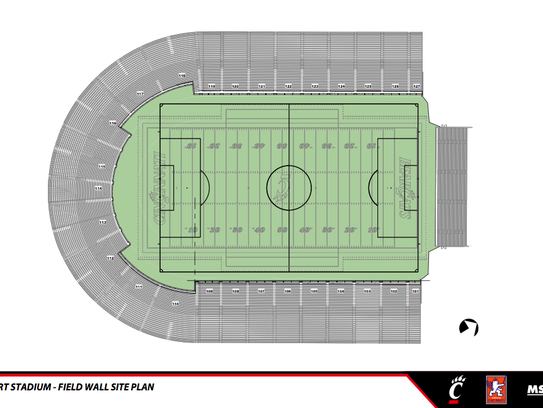 And you don't want to upgrade the last parts of Nippert that are lagging behind. Would you like us to drop the AACs TV contract as well so that there won't be any commercials for home viewers that slow down the game? In college sports, money is kind of a big deal to get ahead. Those sponsorships help pay the bills. FCC renting out HNS is a revenue stream that no other AAC school has. That is a flat out, much needed advantage over our current conference mates, and the scraps below our conference. And inches us closer to the conferences above us. Not to mention all the intangible benefits listed on here ad nauseum. Actually, FCC gets all concessions until UC pays them back. FCC fronted the money and UC will compensate FCC for UC making accommodations on soccer's behalf. (02-24-2017 11:02 AM)bearcatfan Wrote: Just for "re-discussion" purposes. From that drawing, it seems to imply that the football field would not fit without the cutouts. Are they moving the lines for the football field farther South? Come off the ledge. He never said he didn't want any sponsorship/ ad money. All they have shown on ribbon boards since they've been installed in Nippert are ads and logo based graphics. I don't think it's unreasonable to ask for stuff like occasional in depth game/individual player stats and updated scores of other games to improve fan experience. Who knows, it may actually cause people to look at them more often and improve the performance of the ads. (02-24-2017 10:30 AM)gerhard911 Wrote: All of which will be utilized to push even more advertising at fans. These will not enhance the game day stadium experience. I don't think last year they ever put any scores of other games on the scoreboard that were more up to date than two hours before kickoff. (02-24-2017 11:24 AM)crex043 Wrote: I'm sure if UC pulled the money for this out of its donors' pockets the advertising would be minimal. I agree as well. Still, I'd like full, wrap around ribbon boards just so it looks complete. Regardless if it continues to be just ads or a mix of stats and ads.